Blankets and I have had a life-long affair, I just love to be cuddled up in them. I’m an addict. I literally can not watch a movie or tv show and enjoy it if I am not snuggling under one. Even in the middle of summer, it doesn’t matter! I am not comfortable unless I am wrapped up. Also, I have always been baffled by people who are able to sleep under just a sheet. I can’t do that! I must have the fluffy weight of a blanket over me, always. 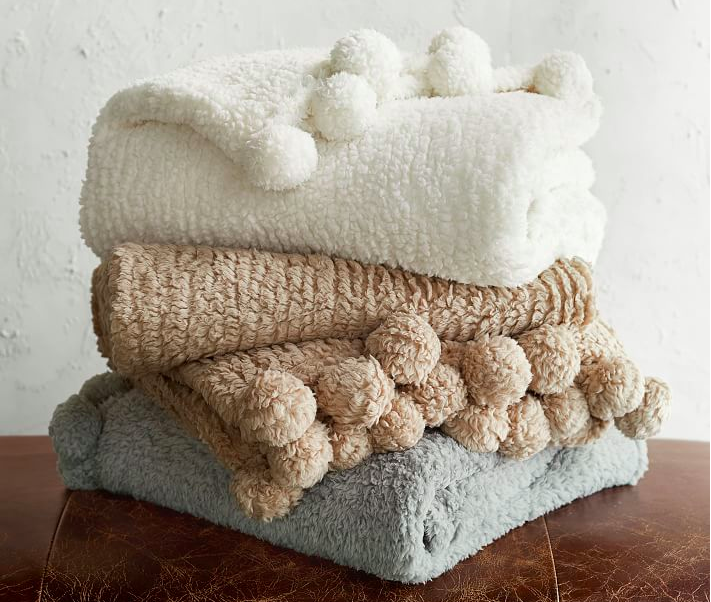 I assume there are other “cozy and cuddly” blanket snugglers out there, so I decided to make this list of a few faves from Pottery Barn. It seems especially appropriate as the weather is starting to get chilly and everyone craves going back to their warm homes at the end of the day and cuddling on the couch with a blanket and hot chocolate, preferably by a fireplace! 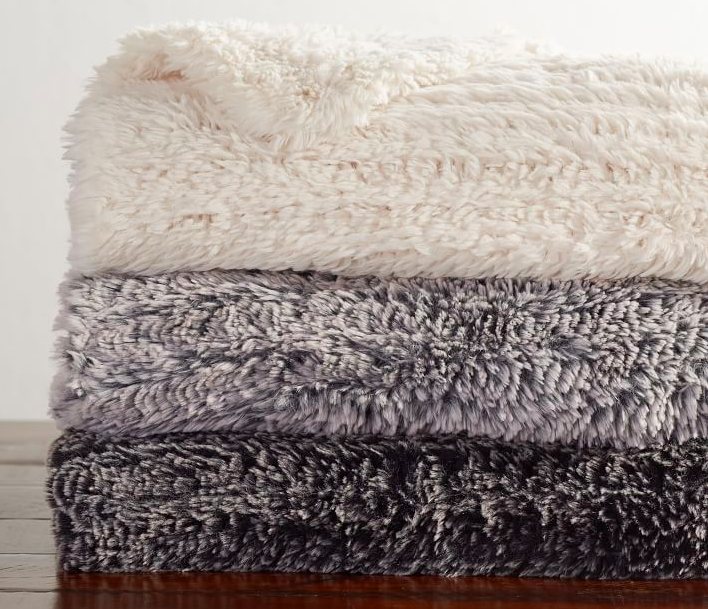 Perhaps you have a cozy blanket lover on your gift list this holiday season? 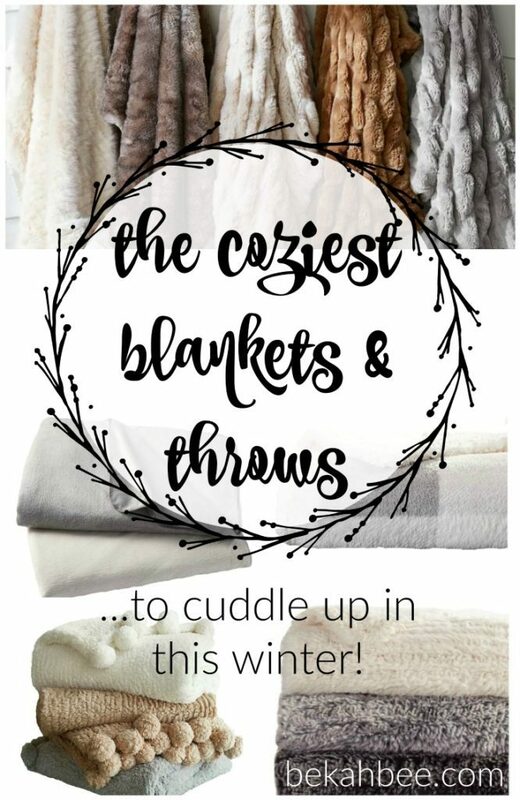 Whether for a friend or yourself, here are my 5 coziest blankets and throws to cuddle up with this winter! 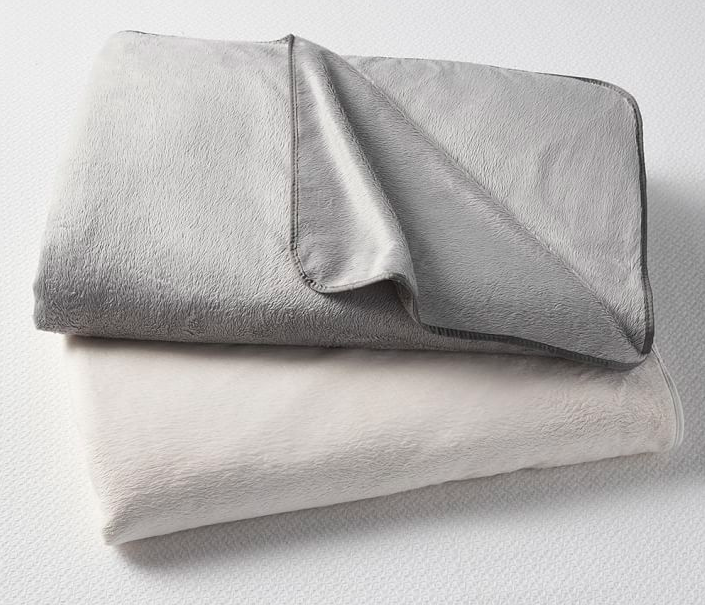 The cozy blanket from Pottery Barn seems like the most under-rated blanket ever to me! From the picture, it doesn’t really seem like anything too special, but in person, it’s a totally different ball game! I stumbled upon this beauty when I had been searching high and low for the perfect throw for the bottom of our bed when I was trying to complete my Master Bedroom reveal! I was starting to get super discouraged I would never find the right one, and had even bought and returned one from Restoration Hardware because it was much rougher in person than it looked online. As luck would have it, I walked into Pottery Barn one evening and saw this beauty styled on a bed and felt how soft it was. Like sleeping in a cloud I like to say! Such a great find. In fact, I loved it so much that we bought it in the grey as well for our living room. Super silky and soft! Also, it’s very lightweight, even though it is cozy and warm. It passed the cat test too because my little buddy Chester had a very fave blanket that used to be at the foot of our bed, but I didn’t love the way it looked there. I wanted to give him a super soft blanket that also went with my color theme and am so happy it all worked out so well. 🙂 One thing to note is that this blanket is huge! It may work better on a bed than a throw for a couch, but up to you! I like the grey and white checked one of these, and it feels just so plush and soft! 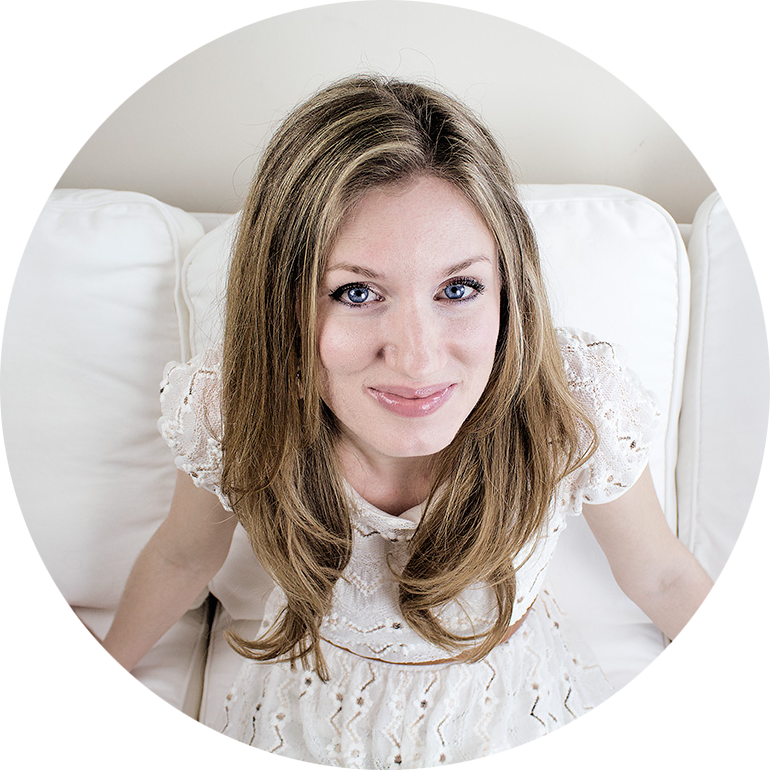 Plus, a portion of the sales goes to Saint Jude, so that is cool too! Have you noticed that pom-poms are super in these days? I must admit, it is one trend that I am excited to get in on, and have been keeping my eyes peeled for a fun pom-pom throw. This one is such a steal at only $39 (when it’s full price!) and feels just as soft and cozy in person as it looks online! I was intrigued by this throw ever since I saw it online, and was just as impressed when I went to go touch it in person in the store. SO cozy and soft, very luscious feeling. I just love the texture of it. I really like all 3 colors and may just have to grab one of these myself eventually! 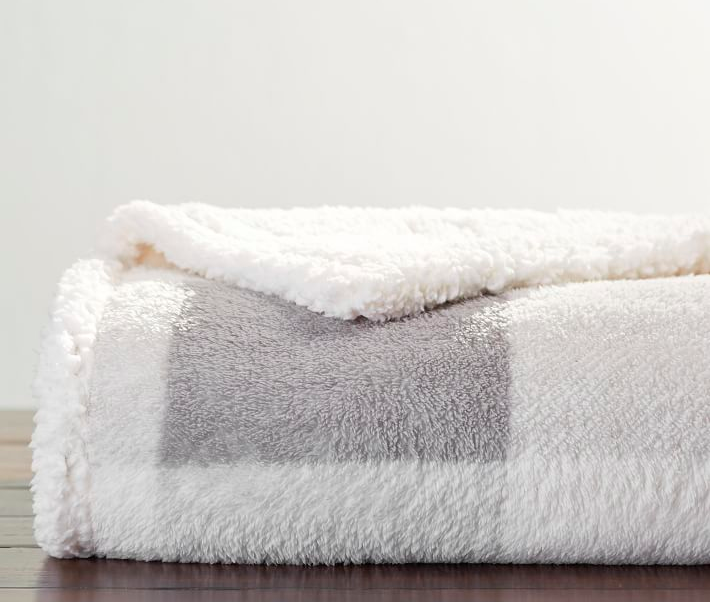 This is the first cozy blanket we ever got, and it has proven to be worth its weight in gold! Hands down one of the best things we have invested in, for sure. 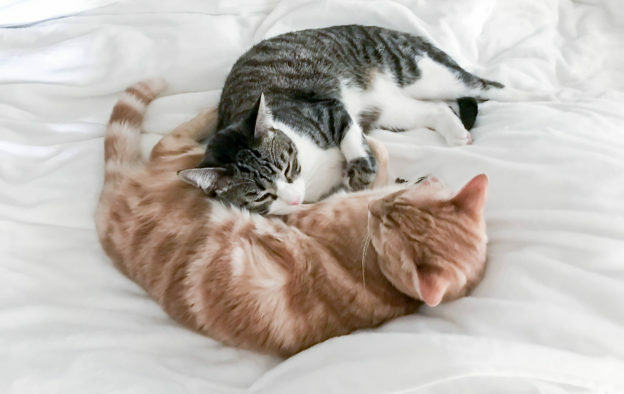 We love it, our cats love it, we have used it laid on the back of our couch for a couple of years now. I have been quite impressed with the quality of the blankets from Pottery Barn since it has held up so well over time, and I wash it every couple of months. I rarely get things when they are full price, instead, I usually keep my eye on them for a while and wait for a sale. Luckily, all these throws are frequently on sale! 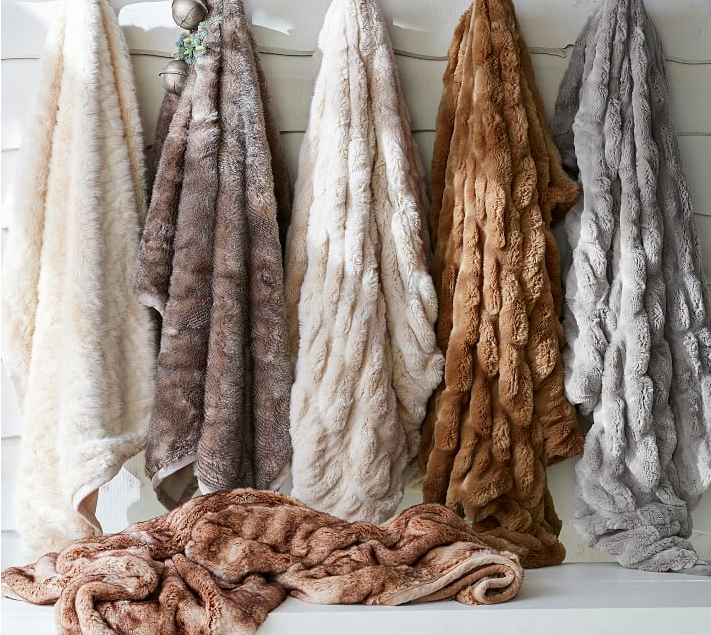 We have 2 out of 5 of these throws, and the rest I have gone and “petted” in person in the store, so rest assured (see what I did there?! ;)) that they pass the “Bekah coziness test!” Haha!